anyways on a much more stylish note, if you read my last post i mentioned that cee of cocoandvera was going to be featuring me on her blog. so check it out here if you haven't already! this look is the one you'll see on cee's post because well i just love how casual and colorful it is. i mean if anyone took a walk in my closet, they would probably get lost is a sea of olive greens and shades of creams. (such a typical redhead, right?) so i guess what i'm trying to say is it felt good to do something different! well, i will chat some more soon, gotta get back to studying for my last finals!!!!!! So adorable! 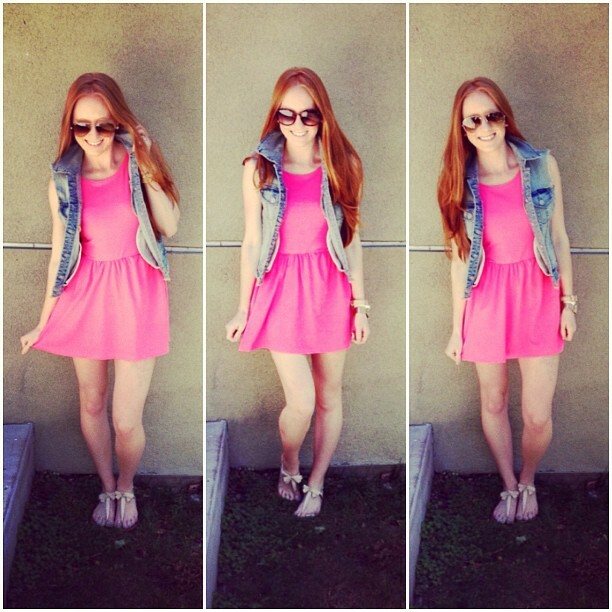 love the color of the dress and the denim vest is such a great touch! love these skater style dresses. great in pink, too! Suuuuper cute, I love the bright pink with denim. You look great!